I really have nothing to say about New Jersey; Corzine (D) continues to trail having only lead in one partisan poll since February. 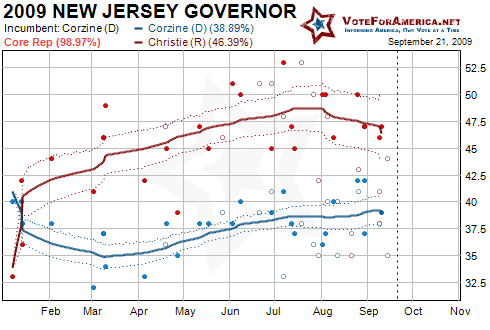 Corzine has clearly solidified his base around 40, but Christie (R) has lost ground in the last month, likely due to the US Attorney's loan scandal. We really need more data to determine whether Christie's downside will continue. The reason for McDonnell's (R) decline can almost certainly be traced to his 1989 thesis in which he stated that working women were "detrimental" to the family. Deeds' (D) effort to highlight this apparent weak point clearly paid dividends in the polls. 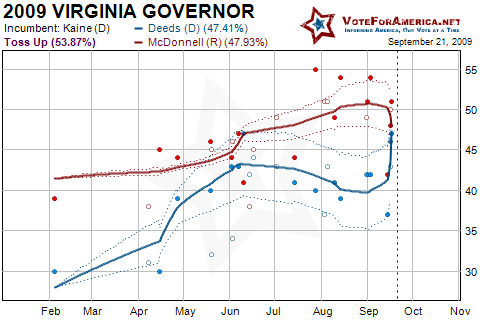 I took a look at the two polls that provided publicly available cross tabs, Rasmussen Reports and the Washington Post in an attempt to glean more information about Deeds' surge. The basic post-thesis hypothesis is that Deeds' performance should have increased in the female voting bloc; unfortunately neither poll provided any gender specific information, at any level.